Home > Exchange Mailbox Recovery > How to Recover Deleted Mailboxes in Exchange Server 2003 ? How to Recover Deleted Mailboxes in Exchange Server 2003 ? Exchange Mailbox is a very important component of Exchange server database as it contains user’s data like emails, contacts, task, calendar entries and more. Microsoft Exchange Server effectively manages multiple e-mail accounts in same Exchange database file but the issue arises when any of the mailboxes get deleted, either accidentally or deliberately and users lost their important data. Here, you need to use a recovery solution to get the Mailbox back. A recent and updated copy of database backup file can also help you. From this backup file, you can easily restore your deleted mailboxes. You just need to mount this Exchange database backup file on the Exchange server. Deletion of any item in Exchange mailboxes sometimes happens due to manual faults & hardware or software errors. Whatever the reason, users have to face the problem of data loss in their account. This blog post describes three ways that you can try to recover or to restore a deleted mailbox in Exchange 2003 server. 1) If the settings of deletion retention are configured properly for user mailboxes, and if the retention period is not yet expired, you can easily recover single or multiple Exchange mailboxes by using Exchange System Manager, which is automatically set up during Exchange Server application installation. (i) Open Exchange System Manager by browsing these steps: Click Start ==> Go to All Programs ==> Click on Exchange System Manager. (ii) Expand the Tools section in left pane. (iii) Select and right-click on Mailbox Recovery Center option and then select Add Mailbox Store. (iv) Locate the name of the Exchange mailbox store that contains deleted mailboxes. Click on OK button. The Mailbox Recovery Center will display complete list of deleted Exchange mailboxes. (v) Right click on desired mailbox that you want to recover and then select Reconnect option. After this, Exchange Mailbox Reconnect Wizard will start that will re-link your Exchange mailbox with particular user account. (vi) Click on Next option. (vii) Proceed further few steps. Aforesaid procedure will complete the task of recovering your deleted mailboxes when Retention period has not been expired. 2) If you have deleted an Exchange mailbox accidentally and the retention period settings are not configured for this mailbox or if the retention period for this mailbox has expired, you can recover lost mailboxes from a last valid backup without any disruption. The Exchange administrator can always prevent or minimize data loss situations by backing it up to other storage media and places; however, this does nothing to secure or prevent loss of live Exchange server data that is yet to be backed up. 3) Third party Exchange mailbox recovery tools. In case the valid database backup is not available and the Retention period of deleted items has been expired, you need to opt for a third party Exchange Recovery Tool. 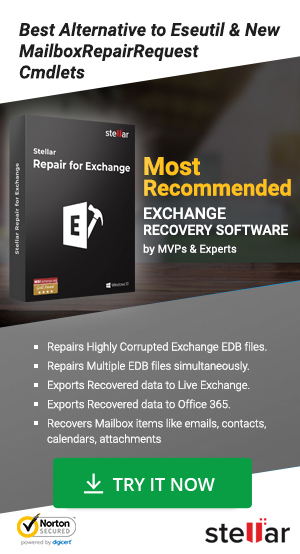 This Exchange recovery tool is very easy to use and supports MS Exchange Server 2016, 2013, 2010, 2007, 2003, 2000 and 5.0 versions. To recover deleted mailbox, just select the Exchange database (EDB) file and the software will do rest. Is it possible to get back all 30+ mailboxes from crashed Exchange server? Try free demo of software for better understanding. In a free demo, you can easily evaluate the performance of the tool.